During the Cretaceous Era some 70 to 100 million years ago, long-necked sauropods ruled the Earth. But in Africa, not so much. The discovery of a previously-unknown species of titanosaur in Tanzania expands what we know about dinosaurs on this continent, while revealing the surprising degree to which these creatures were related to similar dinos living in other parts of the world. Introducing Shingopana songwensis, a name that means “wide necked” in Swahili. The newly-described titanosaur’s neck vertebrae, ribs, humerus, lower jaw, and other preserved bones were recently excavated in the Songwe region of the Great Rift Valley in southwestern Tanzania. A team led by Eric Gorscak from Chicago’s Field Museum of Natural History has completed its analysis of the fossils, the details of which now appear in Journal of Vertebrate Paleontology. Here’s what we know about this new titanosaur: Shingopana’s forelimb was about 1.5 meters tall, which is just shy of five feet. It weighed somewhere between four and five tons (8,000 to 10,000 pounds), which, for a titanosaur, is on the smaller end of the scale. For comparison, the contemporaneous titanosaur Rukwatitan, discovered back in 2014 in the same rock formation, weighed about eight to 10 tons. Apart from its size, Shingopana differed from other African titanosaurs by virtue of a unique bulbous protrusion on the upper part of its cervical vertebrae. It’s also got some “supporting struts” on its spine that aren’t seen in other titanosaurs. 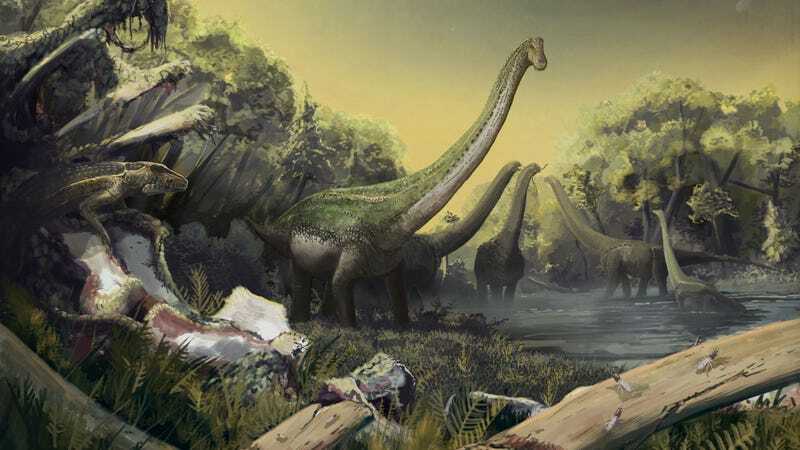 But the most interesting thing about Shingopana isn’t its size or its funky neck—what makes this discovery so special is rarity of the find, and how this particular species can be linked to sauropods that lived elsewhere during the Cretaceous. Bones of titanosaurians have been found around the world, the vast majority in South America (including the newly-named Patagotitan mayorum—the largest animal to have ever stomped on land). Well over 30 titanosaurians have been uncovered in South America, compared with just six in Africa. Weirdly, Shingopana seems to have had more in common with titanosaurs living in South America than it did to those living in Africa. A quick historical geography lesson explains how this happened. 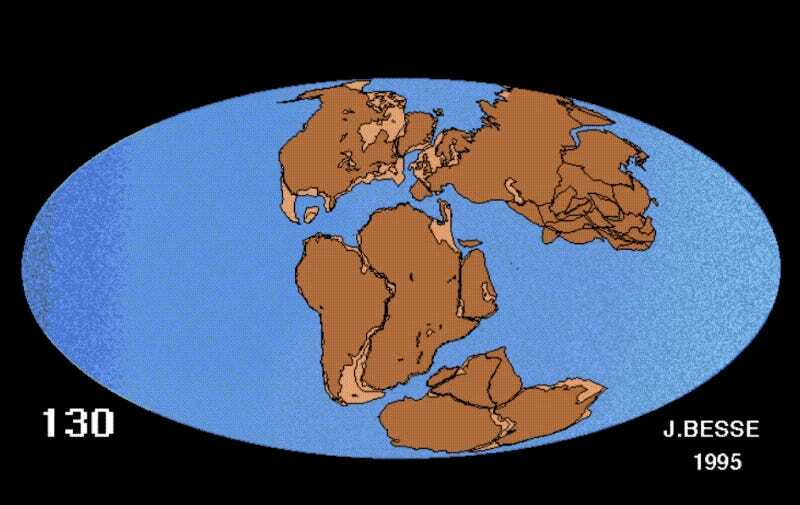 During the Cretaceous, Madagascar and Antarctica peeled away from Africa, drifting east and south respectively. This separation was soon followed by the uncoupling of South America. For a while, Northern Africa was connected to South America by a land bridge, but these continents were finally and irrevocably separated about 95 to 105 million years ago. Sauropod populations caught in this geological divorce became physically separated, spawning new evolutionary trajectories. The terrain and climate of these now-separated land masses dictated where the dinos would live, and how they would transition into new, but related, species. It’s truly incredible what paleontologists are able to figure out these days. As a final final note, this work was partly funded by the National Science Foundation, so cheers to your tax dollars being put to good use.